Just like Oprah, we have things that we like. Seeing as the holiday season is coming up quickly, we thought it would be a good idea to post some things we’ve enjoyed this year that would please any Bourbon Evangelist or newcomer alike. We tried to keep the list to readily available items and give a nice range of prices so you can satisfy anyone from your mandatory Secret Santa at work to your best drinking buddy. If you’ve got things that made you happy this year relating to America’s Spirit, let us know in the comments! 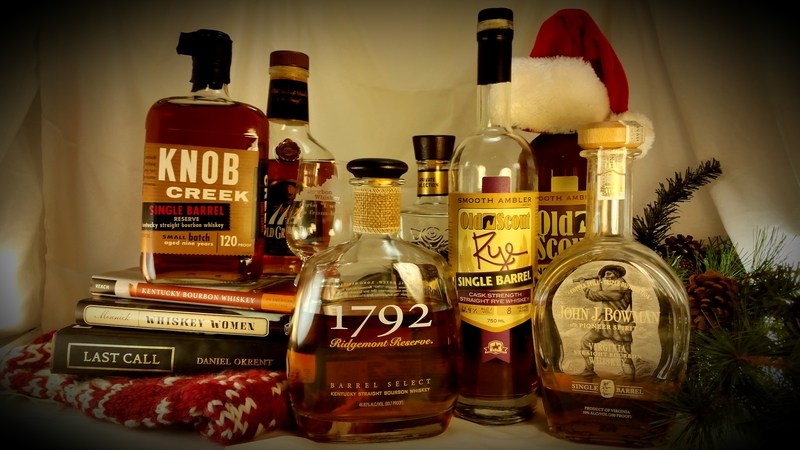 Bourbon – Because honestly, who wouldn’t love to see a bottle under the tree? Old Grand Dad 114 Proof (around $22) – Not for the faint of heart, or those who are staunchly opposed to anything and everything Beam, this high rye bargain packs a punch of rye spice and salted caramel sweetness that can be calmed with some water and/or ice. Excellent in cocktails and neat alike. 1792 Ridgemont Reserve ($25-30) – An easy drinking bourbon from Bardstown, this one will please most palates. Around 8 years old, having recently dropped an age statement, this has been an excellent ‘house’ bourbon for us for quite some time. Four Roses Single Barrel ($30-35, until the price increase hits) – Oh Four Roses, we always forget about you. Jim Rutledge has been producing a fine, honest product for quite some time now (we’re going to ignore Yellow Label). One of the most consistent single barrels on the market, made from a high rye recipe, we think you should remind yourself of this gem hiding in plain sight. Knob Creek Single Barrel ($35-40) – This has been one of our surprise favorites from this year. Neither of us having been Beam fans, the single barrel, 120 proof iteration of Knob Creek snuck up on us. A nose and taste much deeper than it’s regular sibling, we think this may just be the best thing Beam puts out. Also it makes a helluva bourbon and Coke, but don’t tell anyone we said that. Old Scout Single Barrel Cask Strength Rye and Bourbon (Bourbon $45-50, Rye $55-60) – The bourbons made us question why in the world Drew at Willett missed these barrels at MGP, and why he was charging so much for his. The rye changed out entire world view, well, at least our entire view of what a rye could be. Why aren’t you leaving right now to find some? John J. Bowman Single Barrel ($45-50) – Distilled at Buffalo Trace, then re-distilled and aged in Virginia, this Bowman showcases the difference environment can make in bourbon. Though it still holds a lot in common with the older BT products (Elmer T. Lee, Blanton’s, Rock Hill Farms), something is in the air in Virginia that really brings the profile to life. Another one of our favorite surprises from this year. Basket of Mini-bottles (varies) – For someone new or just getting into bourbon, mini-bottles are a great way to try lots of different things without the cost of whole bottles. Plus they’re just fun. Mix it up however you like. Here’s one idea: a tour of mash bills. Kentucky Bourbon Whiskey: An American Heritage by Michael Veach ($19.05 on Amazon) – An easy to read, amazingly well researched and entertaining romp through the history of bourbon by one of the fields’ best known figures. A must read. We made him drink an MFC once with us, and it was awesome. Social History of Bourbon by Gerald Carson ($9.99 on Amazon) – An old book that gives great insight to the history of bourbon from the social perspective. Well worth a read despite it’s age. Last Call: The Rise and Fall of Prohibition by Daniel Okrent ($11.14 on Amazon) – One of our main resources for the Prohibition casts, this book has enough quotes, primary sources, and anecdotes to satisfy even the most meticulous student of history. A great overview of one of the most bizarre parts of American politics. Whiskey Women by Fred Minnick ($14.99 on Amazon) – Behind every great man in bourbon was a woman telling him that his idea ridiculous, and here is what will actually work. Personalized Glencairn ($14.99) – This is what we use for all of our tastings on the cast. Does it work? Honestly, I’m not sure, but it does certainly make you feel fancy. The only thing better is having one with your name emblazoned on it! Private Reserve Wine Preserver ($8.99) – A blend of inert gases, this spray designed for wine is what I use to keep my bourbon from oxidizing once it hits the sweet spot. I’ve never had a bottle go ‘off’ while using this. Great for your prized bottles with just enough for a taste left in the bottom. A Good Cigar (varies) – I recommend getting whatever you like for a friend, always a good talking point. My personal favorite that won’t cost you an arm and a leg is a Romeo y Julieta Reserva Real No. 2. Hopefully this gives you some good ideas to make someone’s day and spread the good word of bourbon as the Bourbon Evangelist you are! Cheers and Happy Holidays! Previous Post Prohibition Part 1 Podcast!